EDI is the electronic exchange of business document data, such as purchase orders and invoices, in a standardized format between trading partners. It replaces paper-based document exchange yielding many benefits, including reduced cost, increased transaction speed and visibility, fewer errors, and improved business relationships. Many businesses use paper-based Procure-to-Pay and Order-to-Cash processes by sending and receiving documents via fax, email, and postal mail. The information used to produce these paper documents usually starts as data within an ERP or accounting system, but is then printed, faxed, or emailed, which requires the recipient to reenter the data. This is inefficient, costly, and can introduce data entry errors. It also takes some time to send and receive paper documents and the buyer or supplier cannot easily know the document status. EDI replaces paper-based processes and ensures both sender and recipient speak the same digital data language. EDI standards began to emerge in the 1970s, and there are now various standards used by different industries, including ANSI ASC X12 and UN/EDIFACT. Prior to widespread internet use, EDI was sent and received primarily over a Value Added Network (VAN), or EDI service provider, which provided secure delivery to EDI mailboxes. In the late 1990s, AS2 (Applicability Statement 2) gained popularity to securely transmit EDI documents over the internet in a real-time, point-to-point manner, and remains prominent today. Other internet-based protocols are now used to transfer EDI data, including Secure FTP and HTTPS. Cloud-based technologies and EDI outsourcing continue to transform and enhance the growing use of EDI. In many industries including Retail, Grocery, Automotive, and Healthcare, buyers now mandate EDI use by their suppliers. Common components of an EDI infrastructure include data translation and mapping software, communications, and specialized IT people. EDI can be implemented and maintained in-house or by using an EDI service provider. An EDI Translator is an on-premise or cloud software application that translates data to a trading partner’s EDI specification and maps EDI data to and from other formats, such as flat data and XML, for use within ERP and accounting systems. EDI service providers offer outsourced data mapping as transactions are sent and received through their trading network. There are various communication methods used to connect to trading partners and service providers, including AS2, Secure FTP, and HTTPS. EDI service providers, sometimes referred to as VANs, simplify EDI communications by receiving EDI data by a single protocol and delivering it to trading partners via their required method. Some common functions of EDI are Business/EDI Analyst, EDI Coordinator/Specialist, EDI Map and Integration Developer, and Project Management. Maintaining EDI also includes trading partner support, onboarding, change events, and internal support. EDI service providers allow businesses to outsource some or all of these functions. WHAT DOES EDI DATA LOOK LIKE? An EDI transaction set, X12 Purchase Order (850) in this case, is segmented into an interchange control, functional groups, and transaction sets. These can be thought of as the envelope containing the sender/receiver information needed for the document to be sent, similar to the addresses on an envelope. 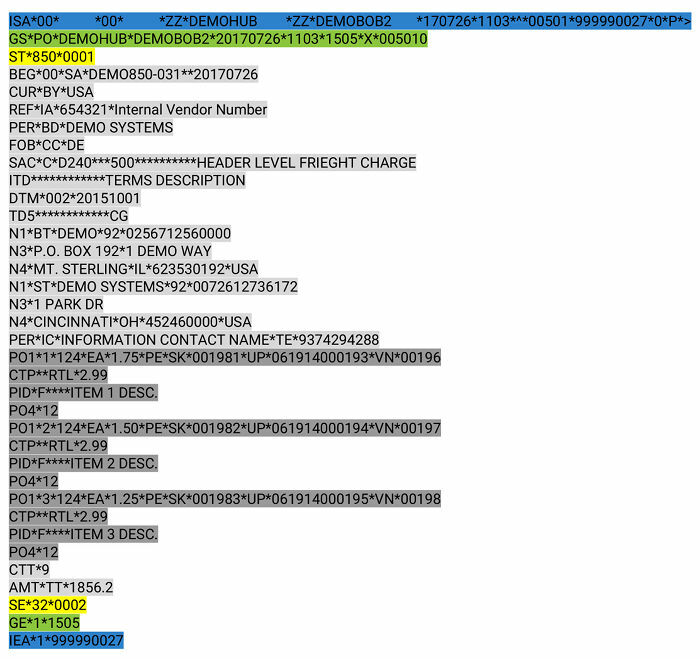 The transaction set envelope contains segments and data elements, which describe the information within the transaction. In this case, we have a single PO with three items being ordered. This is a simple example of EDI. Documents are usually more complex and can contain multiple functional groups and transaction sets. ASC X12 governs hundreds of transaction sets within several industries including Communications, Finance, Transportation, Supply Chain, and Insurance. Although they must conform to standards, individual implementations vary by industry and trading partners. For example, Walmart and Target are in the same industry, but their EDI implementations have been customized to fit their specific needs. EDI is traditionally implemented between a buyer and their supplier(s). The buyer produces an implementation guide that suppliers use to conform to the buyer’s specific guidelines. In addition to implementing and maintaining an EDI infrastructure, suppliers who have multiple EDI customers also support multiple communications methods and differing EDI maps and transaction sets. This diagram illustrates integrated EDI, which allows transaction data to flow directly into ERP and accounting systems without manual data entry. Although EDI eliminates the costs and issues associated with paper-based transactions, implementing and maintaining it in-house has its own costs and problems. Outsourced EDI allows businesses to focus their resources on core business needs, rather than EDI. With EnterpriseEC, our Cloud-based B2B Trading Network, components of EDI can be outsourced individually, such as communications, data mapping, integration, and trading partner onboarding and support. Edict Systems is a leading provider of outsourced EDI services, including fully outsourced EDI operations. Web-based EDI gained prominence in the late 1990s as Retail, Grocery, Automotive, and Healthcare buyers began to mandate EDI compliance. Edict Systems was a pioneer in this area with WebEDI. WebEDI allows suppliers to quickly become EDI compliant without having to invest in implementing EDI. Using only a web browser, suppliers manage EDI documents, in a readable format, within an intuitive interface. Over 30,000 suppliers have been EDI-enabled with WebEDI. Edict Systems also provides supplier onboarding services for hundreds of buyers, including many of the world’s largest.